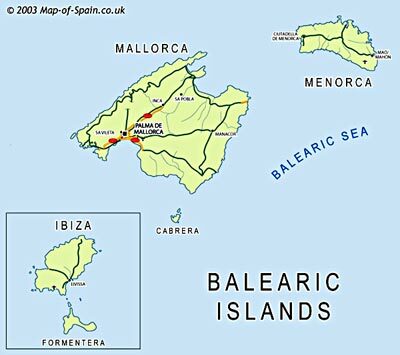 Description: The Balearics consist of an archipelago of 16 islands about 50 miles off the East coast of Catalonia, the main ones being Mallorca (Majorca), Menorca (Minorca), Ibiza and Formantera. Here, vines, almonds, olives are grown. Being an island group, of course fish and shellfish play a major part in the cuisine, as evidenced in frito mallorquina and the extravagant caldereta menorquina. Jewish settlement has had some influence on the cuisine, as it has in Catalonia. It became a dependency of Aragón in 1349 but the language is similar to Catalan. Menorca is the most temperate of the Islands and supports dairy herds which were introduced under British rule. Mallorca is the largest of the archipelago and is well know for its almonds, tomatoes, figs and meats such as suckling pig and lamb as well as rabbit.